The university city of Parma in Italy is well-known for the Parma ham and Parmesan cheese it produces. Dotted with Romanesque buildings, opera houses and art galleries, this city is rich both artistically and culturally. And it is here that we chanced upon a pair of lavish and stately villas which are independent yet stylishly connected, and enjoy similar design and decor schemes. Each come with elegant and tastefully furnished functional areas and has been rendered in soft and neutral tones. Vintage touches and modernism find a common meeting ground in these villas, where functionality and comfort have received equal importance. The suppliers of furniture and accessories at Paolo Cavazzoli adorned these homes to visually and sensually inspire onlookers. 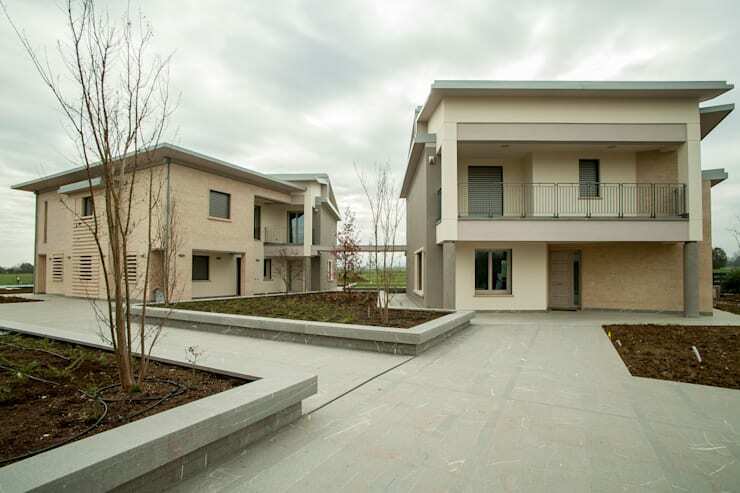 Rendered in soft shades of cream, grey and peach, the villas flaunt sleek and modern lines and large windows. Spacious balconies add to the style quotient of the abodes, while the neat, paved and shared patio make for an expansive feel. Raised gardens wait elegantly to welcome greenery and blossoms. 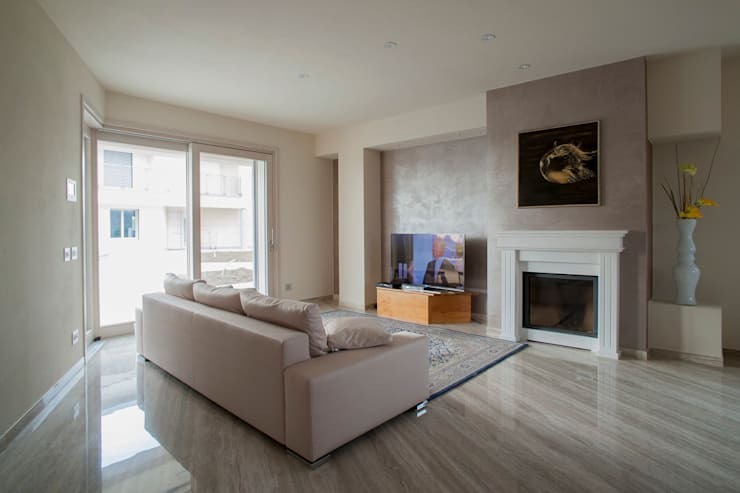 The spacious living area in one of the villas is a sober and sophisticated affair, with gleaming marble for the floor and large glass doors that usher in sunlight and air. The modish fireplace stands against a grey wall with an artwork for aesthetic relief, while a plush couch and patterned rug offer seating comfort. A tall white vase holding yellow flowers add a vibrant touch here. 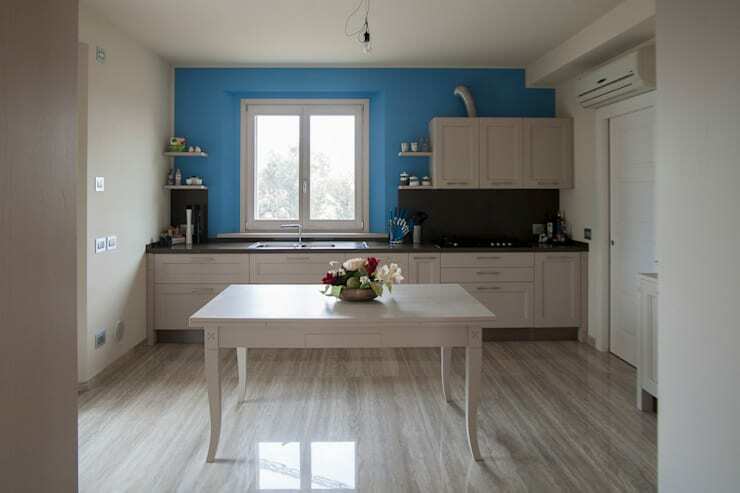 This predominantly white kitchen has been given a dose of liveliness with the blue feature wall and the floral arrangement on the vintage style wooden table. Sleek cabinets and sensible corner shelves offer ample room for organisation, while a fair-sized window fill the area with natural light. 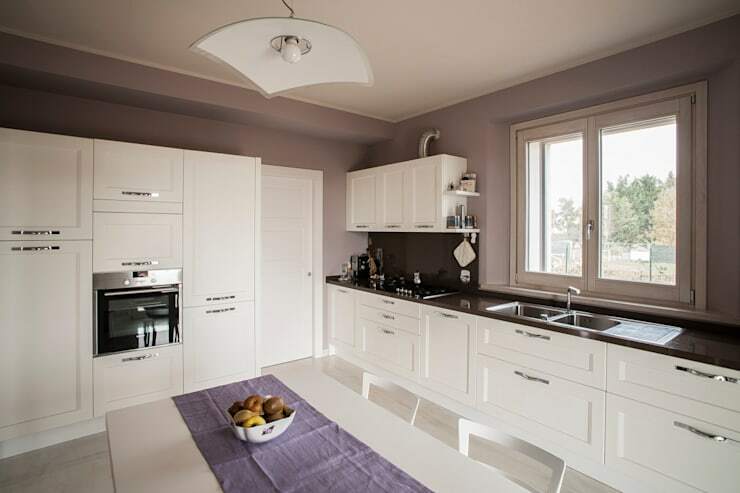 Here’s the kitchen in another villa with cool grey walls, which act as the perfect canvas for the trendy white cabinets and stylish dining arrangement. We love how the modern appliances have been accommodated smartly by the storage units, and the way the clean-lined fixtures lend a minimalistic feel here. 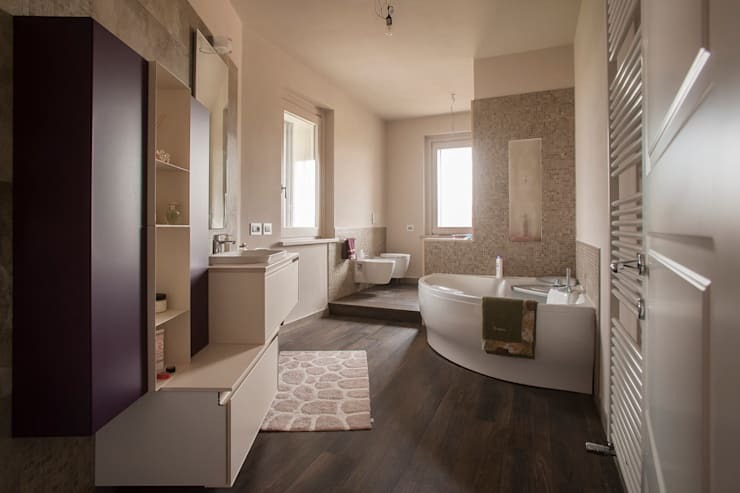 Armed with tons of space, this elegant bathroom wows with its curvy corner tub, stylish storage cabinets, and fashionable sanitary wares. Grey and white join hands with soft wooden tones for a cosy and inviting ambiance, while large glass windows keep the bathroom amply and naturally lit during the daytime. 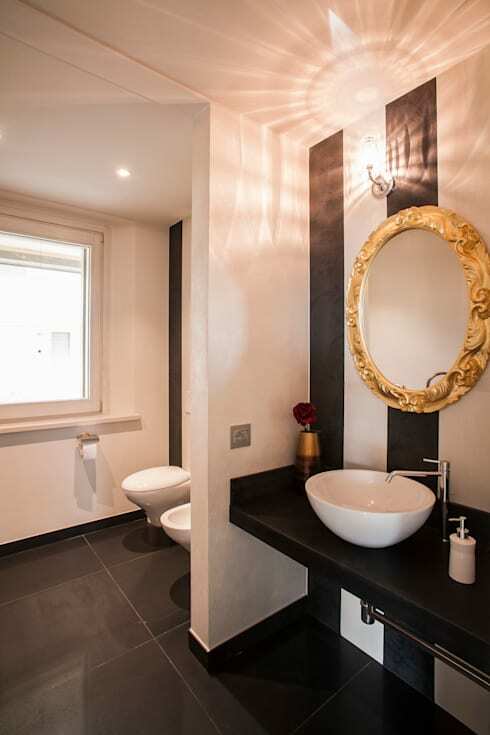 Another smaller bathroom in one of the villas impresses us with bold black and white stripes on the wall behind the sink. A sleek black countertop, a curvy basin, and an ornately carved golden mirror add oodles of personality and class to this space. A slim partition delicately conceals the WC and bidet from the area devoted to the washbasin, while a large window floods the space with sunlight. 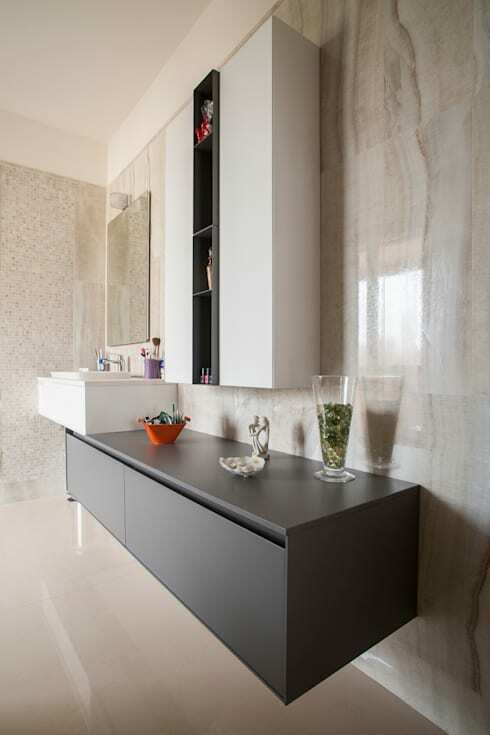 A sleek and quirky countertop makes this bathroom unique as well as ultramodern in spirit. A long, grey wall-mounted storage cabinet quirkily supports the basin unit, and also displays decorative knickknacks with élan. Another slim storage cabinet beside the mirror makes organisation easy too, while classy marble adds glamour to the environs. Simple yet sophisticated designs, sober hues, practical hacks and random touches of boldness make these villas interesting and charming. Check out another tour for more ideas - Drawn Inspiration From This Tropical Dream House.